Louisiana is still one of the leading states for film and TV production, despite Atlanta’s new reign as “Hollywood East”. But the draw for independent as well as studio productions to shoot in the magical city of New Orleans, rich in history and visually stunning from the legendary French Quarter to the surrounding nature, is still strong (right now, there are three TV series and seven films shooting in the city). It is also no secret that Louisiana is one of the country’s poorest states, which makes the ambitious work of the New Orleans Film Society (NOFS), which also puts on the yearly festival in October, all the more commendable. At their yearly spring gala, NOFS has one goal and one goal only: to raise as much money as possible for their flagship New Orleans Film Festival and filmmaker development programs, first and foremost the minority filmmakers’ lab. 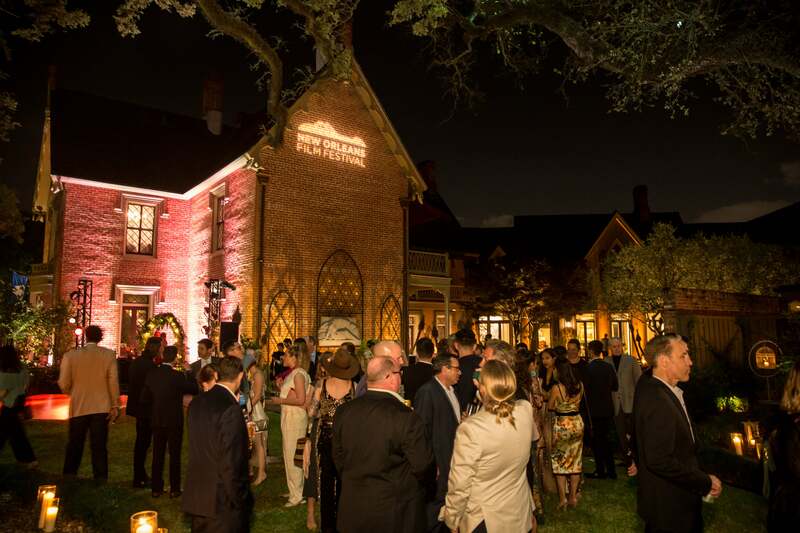 For the first time this year, the HFPA supported the event, which was held in the luscious garden of the historic Bruno-Wilkinson mansion in uptown Nola. Titled “Midnight in the Garden”, it was a most colorful party, from the taxidermy peacocks to life-size alligator statues to a slew of characters dressed as birds, it was a feast for the eyes as well as the stomach. This wouldn’t be New Orleans without the best restaurants catering the event. And there was music, of course: Cellist Helen Gillet took the stage during the dinner portion and DJ Musa provided the dance tunes later on, when the guests were hitting the dance floor after the auction. A New Orleans night in the garden, for a good cause. 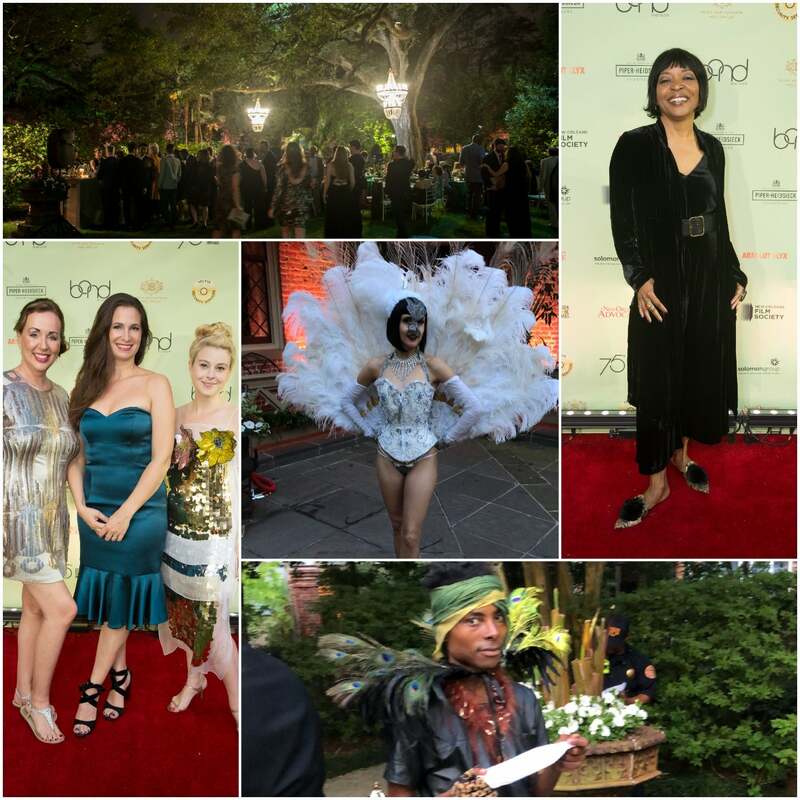 Clockwise from top left: the gardens of the Bruno-Wilkinson mansion; Queen Sugar star Tina Lifford; the birdman barkeep; co-chairs Nicelle Herrington, Martine Chaisson, and HFPA journalist Elisabeth Sereda; bird girl. I co-chaired the gala along with local documentary filmmaker Nicelle Herrington (A Tuba To Cuba) and gallerist Martine Marie Chaisson. Driving up the prices during the auction was one of our main jobs. Local filmmaker Alexa Georges, honorary chairman and creator of the event (the NOFS gala is her baby) bid up a storm at the auction, too: vacation destinations, weekend stays, premiere tickets, VIP passes to the New Orleans Film Festival, a coffee machine signed by George Clooney, a walk-on for four on the locally filmed set of hit TV series NCIS: New Orleans, an outdoor screening party, private dinners hosted by famous chefs and artworks racked up almost 35.000. Add to that the sponsorships, patron tickets and gala tables, and this one night-event garnered $125,000. Queen Sugar’s Tina Lifford (she plays Aunt Vi), who participated in the HFPA’s Women Breaking Barriers panel at the Sundance Film Festival last January, was so impressed with the programs that she gave a donation on top of attending the gala.